Click here to learn more about this event in Facebook link. Clara Kim is an artist located in Ottawa, the capital city of Canada. She creates wonderful acrylic paintings and provides private coaching lessons for local aspiring artists using acrylic paints. 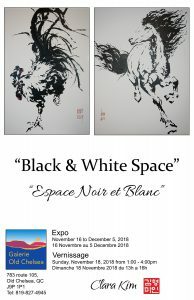 art, art ottawa, artgallery, artottawa, artsquebec, black and white space, blackandwhite, blackandwhitespace, chelsea, drawings, Event, gatineau, oldchelsea, quebec, soloevent, soloshow, thingstodo, Vernissage. Bookmark.